Recently I received a set of Sabian HHX cymbals, so I decided to give them a whirl and see how they stack up to their competition. In this cymbal pack, I got a HHX hi hat set, HHX ride cymbal, and HHX crash. These are Sabian’s higher quality cymbal line, ranging from 150-300 $ depending on which cymbal you get. The sizes of the cymbals I got were 14 inch hats, 18 inch crash, and 21 inch ride. Before I go on, I would like to mention that no matter which size of cymbal you get, the quality and sound will be similar, so take this review into heart when purchasing your next set of cymbals. There are two types of HHX series cymbals that you can buy. There is the regular HHX, and then there is the HHX Evolution. The HHX Evolution cymbals come in a brilliant finish, meaning they are very shiny. The HHX series comes in a natural finish, meaning it is less shiny, with more of a bland look. 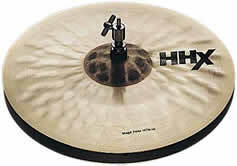 Unlike a lot of Sabian’s other cymbals, the HHX series did not have a massive SABIAN logo on it, which was nice. Instead, it had the letters HHX on a small portion of the cymbal. The cymbals looked very nice, like they were hand hammered. This is nice to have; it separates your cymbals from other machined cheaper cymbals. Another nice thing about these cymbals was the bell. The bell of the cymbal was a dark almost burned like color. It was just really nice to look at these cymbals because you could almost see the steps takes in hammering out the shape of the cymbal. A very raw look. Just because the finish is very natural, and the cymbals look raw, does not mean they sound this way. These cymbals really pack a punch when it comes to projection and tone. The Ride cymbal had a very nice dry sound to it. The cymbal was thick enough to handle my hard hits, and thin enough to sustain the tone for a lengthy period of time. I was very impressed by the consistency of the ride cymbal. In addition, the bell of the ride produced a very rich, hi pitched sound that tops any other cymbal I have played. The only thing I could ask for more is brilliance; I believe this cymbal could have had a bit more zing to it; however that is easily forgotten when playing this awesome ride. The crash cymbal packed a loud punch. The thickness and feel of this crash cymbal was excellent, providing excellent sustain and high tones. What I liked the most about this cymbal was variety of sounds you could get from it. Because it was hand hammered, the cymbal is very personal, allowing for different sounds in different places. A great way to personalize your drum kit. The hi hats were of the same caliber as the others. I personally like the bell of the hats, because they are a darker color, it makes it easy to distinguish the two when playing. The HHX hi hats gave off solid tones whether opened or closed.